Fit to flatter, the Proper Attire Skirt has two wonderfully wearable options to choose from. Option A has a flattering bias-cut yoke that anchors lovely pleats and comfy pockets. Option B boasts plenty of piping, kicky knife pleats, and a sailor-style yoke with buttons ranking it very high on charm. XS: waist 28", hip 38", length 20 3/4"
S: waist 30", hip 40", length 20 7/8"
M: waist 32", hip 42", length 21"
L: waist 34", hip 44", length 21 1/8"
XL: waist 36", hip 46", length 21 1/4"
2XL:waist 39", hip 49", length 21 3/8"
3XL:waist 42", hip 52", length 21 1/2"
4XL:waist 45", hip 55", length 21 5/8"
2XL: bust 42/43", waist 3/36", hip 45/46"
3XL: bust 45/46", waist 38/39", hip 48/49"
4XL: bust 48/49", waist 41/42", hip 51/52"
Medium to heavier cotton wovens or cotton velveteens, 44" or 54" width for either option. To make yoke from a contrast fabric as shown, an additional 1/2 yard is required. 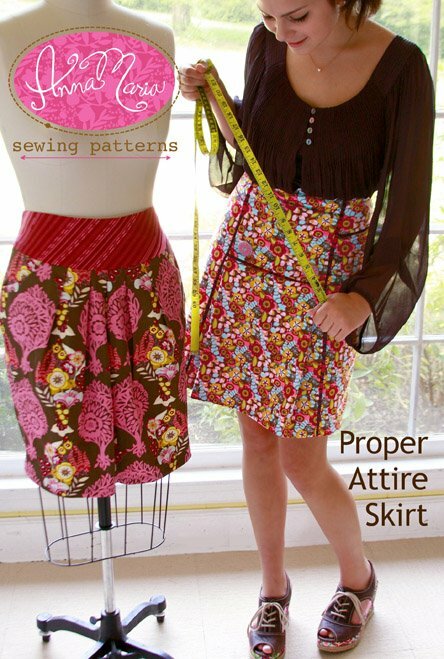 To include piping in all seams as shown, an additional 1/4 yard is required. *Remember to allow additional yardage if you'd like to center or match any fabric print features.